Radio telescopes may be made much larger than optical/infrared telescopes because the wavelengths of radio waves are much longer than wavelengths of optical light. A rule of thumb is that the reflecting surface must not have irregularities larger than about 1/5 the wavelength of light that is being focused. By that criterion a radio telescope is several hundred thousand times easier to figure than an optical telescope of the same size. 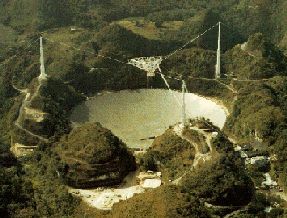 The Arecibo Observatory radio telescope is a 305 meter reflecting surface in a natural limestone sinkhole in NW Puerto Rico. Because the telescope cannot be pointed independently the telescope is "steered" by the gregorian instrument housing supported over the telescope. Because radio signals are detected as waves, signals from different telescopes can be added to simulate or synthesize the resolving or pin-pointing capability of a much larger telescope. 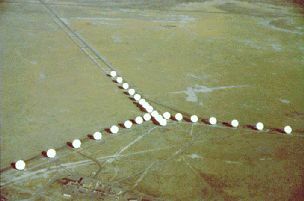 The National Radio Astronomy Observatory's Very Large Array (VLA) near Socorro, NM, consists of 27 radio telescopes, each 25 meters in diameter which are deployed on a Y-shaped track which may be extended up to 36km. The VLA has the resolving power of a 36km telescope (but only the collecting-area and sensitivity of a 130m telescope). The Very Long Baseline Array is a global interferometer with radio telescopes from the Virgin Islands to Hawaii, synthesizing a radio telescope nearly as large as the earth.